Time, certain foods and beverages, and oral hygiene habits can all contribute to tooth decay. If decay becomes serious, a filling may not be sufficient. Dr. David Pousson offers durable, ceramic dental crowns at his Slidell, LA, office to save a tooth affected by decay or trauma. Dental crowns are not removable, and look and feel like real teeth. For unmatched support and strength, some patients consider dental implants as the foundation for their crown. Dental crowns are ceramic caps used to repair a tooth severely damaged by trauma or decay. They are custom-crafted to fit over your tooth, and can be attached to a dental implant to offer enhanced support. Crowns are used to protect a weak tooth from decay, breakage, or other damages. They can also be used to restore a tooth when a filling is not sufficient. Many patients use dental crowns to hold a dental bridge in place. Crowns are a versatile restoration because they add structural integrity to a compromised smile, while offering cosmetic enhancement. Dental crowns encase the visible portion of a tooth. Two procedures are typically required to place the crown. Your first visit will include an initial cleaning, examination, and oral cancer screening to check your oral health. Once Dr. Pousson determines your candidacy, he will begin preparing your tooth for the crown. Your dentist may take x-rays of the affected tooth to examine the roots. If there is severe decay and the roots are compromised, you may need root canal therapy or even an extraction followed by a dental implant, and finally a crown. However, if your tooth roots are healthy, Dr. Pousson will anesthetize your tooth, and gently begin shaping it for the crown, removing all decayed tissue. Dr. Pousson will only remove the least amount of dental tissue necessary. Living with a damaged or decayed tooth can impact your confidence and self-esteem, but a dental crown can restore your tooth, and fosters a natural-looking smile. Once your tooth has been shaped, Dr. Pousson will take an impression of your tooth with dental putty. This impression will guide the fabrication of your crown. Dr. Pousson will match the shade of the porcelain to your surrounding teeth. 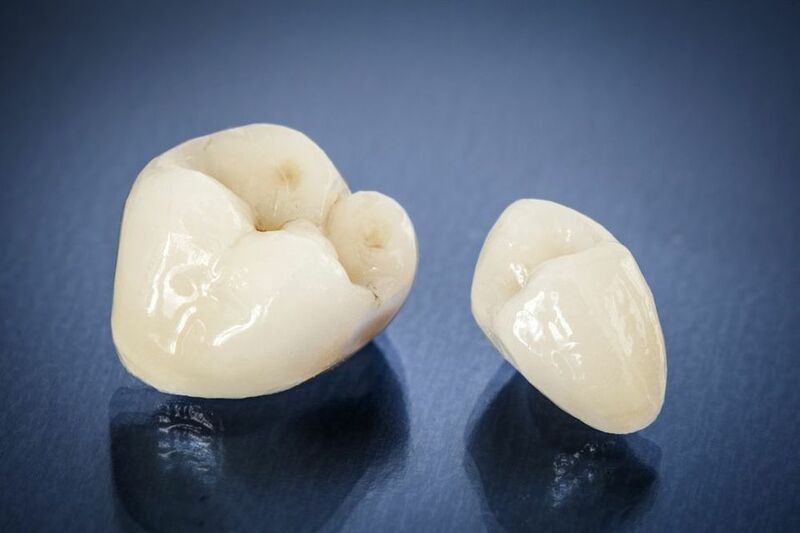 A temporary crown will be placed on your tooth while our partner ceramist creates your custom-made restoration. We work with a local ceramist who has a swift turnaround time of two to three weeks. When your permanent crown is ready, Dr. Pousson will verify the fit, color, and function of the crown. You will need to be diligent about cleaning and maintaining your crown. A meticulous oral hygiene regimen is the most effective way to prevent dental crown failure, as well as any other oral health complication. Be sure to schedule regular checkups with Dr. Pousson to ensure you are getting the most out of your dental crown. Do you have at least one broken, decayed, severely misshapen or discolored tooth? If so, you may be a candidate to receive a dental crown. It is important to understand that any decay must be treated before a crown is placed. Dr. Pousson is very experienced and can discuss your oral condition with you to determine the best treatment plan. Living with decayed, damaged, misshapen, and discolored teeth can affect more than your oral health. It can significantly impact your confidence, self-esteem, and willingness to smile. Dr. Pousson can help you feel confident about smiling with a dental crown. To learn more and schedule a consultation, contact our office today!